Welcome to Crocker & Starr’s Wine Store. If you are a Casali Member and are looking for a wine that is not listed below, please contact us at the Farmhouse 707-967-9111. 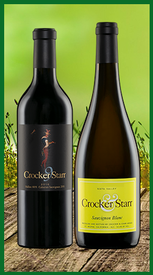 If you are new to Crocker & Starr Winery and would like to become a member, please click here. There is no charge to sign up to become a Casali member and you will receive guaranteed access to our portfolio of limited production wines. Founder Pam Starr and winemaker Evyn Cameron designed this blend to express the best of the Crocker Estate's diverse terroir, and the resulting wine is reminiscent of a Right Bank Bordeaux blend. This AVA Napa Valley begins with Cabernet Franc from estate block 5 and 8 and is layered with Merlot, Malbec and Petit Verdot. Pop the cork now; it will drink beautifully. Join us Saturday, May 4th noon to 3pm for our 5th annual Spring Fling at the Estate! We will be pouring the new releases of 2018 Sauvignon Blanc and 2016 Malbec 'Casali 9' blend paired with small bites. $60.00 for food, wine and fun!